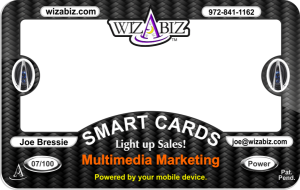 Wizabiz Smart Cards will light up sales. Wizabiz smart cards use your mobile device to project animation and videos through a clear card using the Wizabiz app which makes the card shareable. The cards are the size of a credit card and can be custom designed for each client. The cards can have all your contact information on them. Perfect for promoting a new product. The cards are custom designed for each client along with the special device projections. Every set of cards will be unique and so will the experience. © 2015 Wizabiz all rights reserved.